This post is not about the haunting defeat of the Texas Rangers by the San Francisco Giants in the 2010 World Series. We do not even speak of baseball these days. 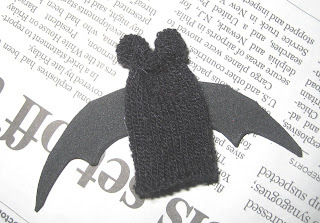 This photo is a very cute and easy Halloween project for which/witch I can claim zero credit. Find a bunch of black one-size-fits-all gloves at the Dollar Store after the winter. Get some Fun Foam at the craft store. Make a few stitches, and your bat finger puppet vill vant to dwink your bwood. Should you need something scarier to contemplate, my brother reports from Saipan that the endangered fruit bats of the Mariana Islands are considered a culinary delicacy worth risking federal prosecution.